If you have ever watched a T.V. show or a movie and wonder how they create all of the monsters, aliens, and other makeup special effects that you see then this is the book for you! 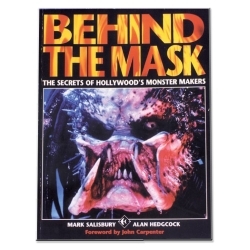 This book is written by Mark Salisbury and Alan Hedgcock and shows you the secrets of Hollywood's monster makers from movies including Aliens, Batman Returns, E.T., Gremlins, and Terminator 2.